The last time I went fly fishing was in late October of last year. Three and a half months of winter, snow, ice and misery had made me almost forget that fly fishing existed, that it was even possible to spend time in a stream with the trout. This past week, when the temperature in Connecticut reached into the high thirties with abundant winter sunshine, it felt downright tropical. So I decided to head out to the river. With four layers of pants and an equal number of shirts and sweatshirts, I headed for the local TMA, trout management area, where catch and release fly fishing is permitted year round. 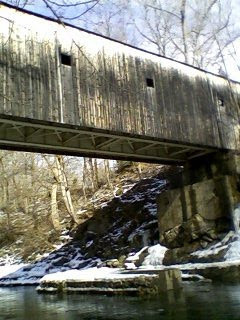 This section of the river begins at a classic New England covered bridge, and flows down amongst rocks and boulders. With snow on both banks of the river, I quickly discovered that wading in the winter ice and snow is much more difficult and dangerous. The snow covered the riverbanks and it was impossible to tell exactly where the water began. I walked one careful step at a time on the snow. Most of the time the ice held my weight. Occasionally, I broke through, falling into about six inches of water. 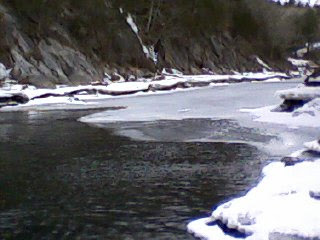 The quite and solitude of the winter river nourished my soul. I gazed at the pure white snow covering the banks. I heard that familiar sound of the river that I had missed for months. And when I began to cast, I felt once again the smooth motion in arms as the tiny fly slid gracefully through the air and landed gently on the water. When we return to the river after months away, we remember again, as if for the first time, how fly fishing can nourish every part of us; our eyes feast on the beauty of the river, our nose and lungs take in the pure air, our ears hear the sounds of rushing water, and our hands gracefully send the fly onto the stream. 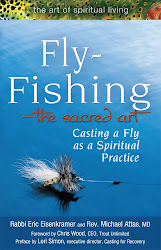 Psalm 150 says: “Let every soul praise God, Haleluyah!” However, we could also translate this Hebrew verse as: “Let all of the soul praise God.” When fly fishing, we engage our mind, body and soul in an act that is meant to catch trout, but can also connect us to the Divine. The TMA that I fished had many deep pools that I hoped were filled with trout. With no surface activity, I fished nymphs and underwater flies. Yet three hours of careful wading and casting yielded not a single bite. After fishing the pools for about a mile downstream, I saw that the river was frozen, and I knew that my day of winter fly fishing had ended. I suspect that this stream did have trout that survived year-round, but I simply could not find them. 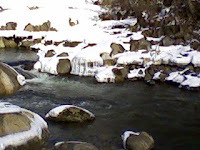 Later back at home, I came upon an article by Tom Rosenbauer of Orvis entitled “How to Catch Trout in Winter.” (Might have been a good idea to research first before heading to the stream, but I was too excited to get out on the water!) Tom wrote that trout generally will not feed below 40 degrees and the day that I went it was in the mid to high 30s. He also recommended fishing nymphs and streams, and even using a sinking line to ensure the fly travels deep enough into the pools where the trout live during the winter. Not too far from my home is a large reservoir. Every time I drive by on a winter morning when the surface of the reservoir is frozen, I see people standing on the middle of the lake ice fishing. I always shake my head and think to myself, “They are nuts. I’ll never do that.” But then there I was, on a February afternoon, wading through snow to cast my fly rod. A day of winter fly fishing reminded me of how much I missed casting a fly and it was very satisfying. But I think I’ll probably wait another month or two until the snow has disappeared, the mercury is higher and the trout are rising, before returning to the stream in earnest. I had a very similar experience. I just went fishing this past weekend for the 1st time in months and also caught nothing. I can relate, though, that it also nourished my soul to be out of doors and on the water. I too enjoy getting out on the water during the winter. I recently caught a brown trout on a 6'6" fiberglass fly rod that I built over the winter. The temps were in the 20's. I have also been skunked at other times as well. That said, a day on the water always refreshes the soul. Hope to see you on the Farmington this summer. I hope to be on the Farmington too!